email me rather than phone. I am approx 3.5 weeks booked up in advance except for Aircon jobs. Emergency Breakdowns/General Servicing/Alarm Fitting is no longer provided. Working in the Motor Trade since 1992, I have experience in both the Main Dealer environment and running a workshop of my own, under the business name of Minifix (specialising in the original Mini). My experience includes all types of Servicing/Repairs, Engine & Electronic Diagnostics, MOT Testing, Spare Parts Supply and Bodywork/Restorations. The service I provide is polite, reliable and enthusiastic. Why waste time & money when you can have the work done at your convenience - and to main dealer standards? Be sure to book for any Aircon Servicing early this year. After last summer's heatwaves, the price of refrigerant for the average family car has sky-rocketed recently, from about £6.50 in 2017, to £22.00 approx now. Winter prices for gas are usually a lot less, so getting your service done before any warmer weather begins would be a wise choice this year. Fixed price of £75 for Recharging your Gas (R134a only) for all jobs within circled map area. R134a gas is the most common gas for all vehicles made between the late 1990's & 2012. Older cars use on R12 Gas (Freon), some new cars use 1234yf. I do not cater for the old R12 systems. I will provice a service for vehicles using 1234yf in the not too distant future, but cannot do so as of Jan 2019. Having worked in a main dealer for a number of years, you can be assured that most types of electrical/electronic fault have been experienced. 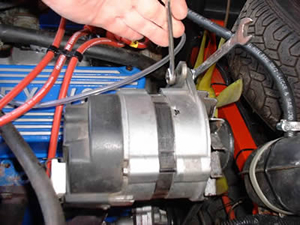 Trace/repair faults with engine management using modern equipment. Second opinion given for work where you are unsure whether you have been given the correct diagnosis. Rover V8 diagnostic check, for all vehicles fitted with the 14 CUX Type ECU System which have a diagnostic 4 pin socket. Should cover all TVR Chimaera's & Griffiths fitted with Catalytic convertors. Also some Marcos, Morgan, Land Rover, Range Rover models etc etc. See link below for price list. Classic Mini fitted with the 1.3 SPi (Single point injection) engine - e.g. 1990's Mini Cooper etc. MPi injection models can also be checked - please call or email for details. I can Diagnose the following makes: Alfa Romeo, Audi, BMW, Chrysler, Citroën, Daewoo, Daihatsu, Fiat, Ford, GM/Opel, Honda, Isuzu, Jaguar, Lancia, Land Rover, Lexus, Lotus, Mercedes, Mini, Mitsubishi FTO, Nissan, Peugeot, Renault, Rover/MG, Saab, Seat, Skoda, Smart, Subaru, Suzuki, Toyota, Volkswagen, Volvo. Please note cars that were pre OBD2 (standard diagnostic protocol now in use) can sometimes require special hardware & software that is specific to that model alone. Examples of which are the Mitsubishi FTO (which I have the correct hardware & software to diagnose), Jaguar (pre 2001) which I don't have (yet)! The hardware kit for the early Jags costs about £350 so please understand that occasionally it may be simpler & cheaper to visit a main dealer. Cars with OBD2 however can all be checked without main dealer tools. With Renault Main dealer experience, and being the owner of various models of Renault including 5, 11, 19 16v and Williams Clio, the service I can offer is second to none. Experience with all models up to present day, you can be assured that specialist knowledge and familiarity will mean the work done is of top quality. Knowledge of Clio II (172, 172 Cup, 182, 182 Trophy, 255 Rear Engined V6), Clio III (197 Sport), Megane (all models including 225 Sport) , Scenic I & II, Espace III and IV (latest style). Water leak detection & rectification - applies to all vehicles out of manufacturers warranty, including the Megane II Coupe Cabriolet. General Servicing is no longer available - due to workload. General repairs are no longer done, with the exception of classic car work. Engine coolant system health check service. This is most important before winter and holiday times to catch any faults before they could get serious. Coolant level, mixture, water pump condition, hose condition, thermostat operation and cooling fan operation are all checked. Ford V6 Essex engine also my speciality including performance tuning & general serciving - useful for owners of Ford Capri, Ford Granada, TVR 3000M & 3000S, Marcos, old Ford Transit Vans etc. Commonly many jobs are to diagnose & repair vehicles which have been unable to get to a repair garage, put out service lights, also ABS/Airbag warning lights especially as these lamps must work then extinguish to enable an MOT pass. In the winter it's heater fans not working and drum brakes seized up.